This is a thinking out loud post. I have now received 2 other rulesets and have had a chance to look through them. I have some pressure to go with a set in the short term as myself and Iannick at Clash of Empires are planning to have our first WWII game at the end of August. WWII gaming is completely unknown to both of us and I have tasked myself with the scenario, rules and figures. There are 2 major pressures: Getting the figures done and picking the ruleset. I have pretty well completed the DAK forces for a starter scenario, and am well on the way to completing the Allied force. I do not see that as a problem. I also have a basic scenario with an OB already in the works. So a ruleset.......the great unknown! In the short term, 2 things seem to be standing out as important factors. Number of figures and vehicles (I can not paint up hundreds of figures and vehicles in the next 2 months) and the simplicity of the rules. 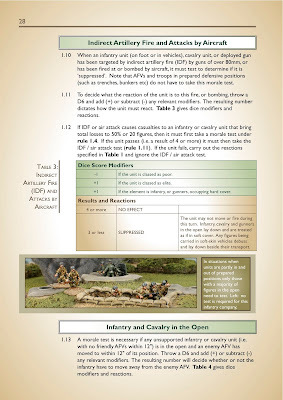 In respect to number of figures, I find that I can easily put together a starter OB for IABSM and Rapid Fire. Just can not get interested in FoW, too many supernumerary figures. 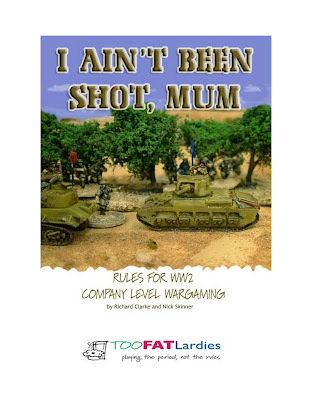 I downloaded I Ain't Been Shot, Mom (IABSM) a couple of days ago, I have always been intrigued by card driven sets and blinds, great stuff. Liked both Field of Battle and Le Feu Sacre, but FoB missed some detail for me and I found LFS a little complicated and did not like the basing. IABSM looks like a real cool set and the support group is enormously helpful. It need few figures as it is at the company level. I keep on hearing though that for beginner, it may be a little tough as a lot of the rules are up for interpretation, which is cool with me, but I have no experience and and maybe we should start with something a little more rigid. It is nice. The ruleset is at the battalion level, but uses very few figures, a company is generally 8 figures, including heavy weapons. Additionally, there are 2 starter scenarios of with basic rules and one with advanced rules. Both scenarios are run through for a complete game in great detail, this is really how rule books should be done. I wish some of the new Napoleonic sets would have done this. The book has multiple organisation charts which are much more elegantly laid out than even FoW. I also purchased their North Africa support book. This is wow! Plenty of scenarios and amazing organisational charts for several nations and units. Great stuff. So what to do, what to do? Well I think I will construct a starter OB and scenario that is doable for both rules (it is actually pretty simple) and have a little go with each set before the end of August when I head to Montreal. Any thoughts? I will try to get some photos of my new units up soon. On the right hand column the area called "Resources Section". Hope you enjoy the game as much as I have had so far. Thanks Anibal, I am well acquainted with your website and resources. Certainly I am going to give IABSM a go. Stay tuned for my starter scenario. I should have it up in a few days. The main thing I am trying to do now is collect and paint the figures for the OB, thus I want to have enough to run IABSM or RF. I will try to figure out how to send the scenario on to you as it now stands, I would value your input. 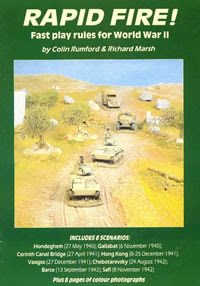 As you probably know there several IABSM scenario books on sale on the TFL website, but also in the Yahoo Group you have plenty of free scenarios for downloading (see the FIles section) covering most of IIWW theaters and periods, just in case it can help you getting introduced into the system. Keep at it though - the search for the holy grail of the perfect WWII rule set is an interesting one! Thanks Steve, I found through Napoleonic rulesets that it is a process. I like FoB and Lasalle initially because they were the most understandable. Detail was missing so I moved on. 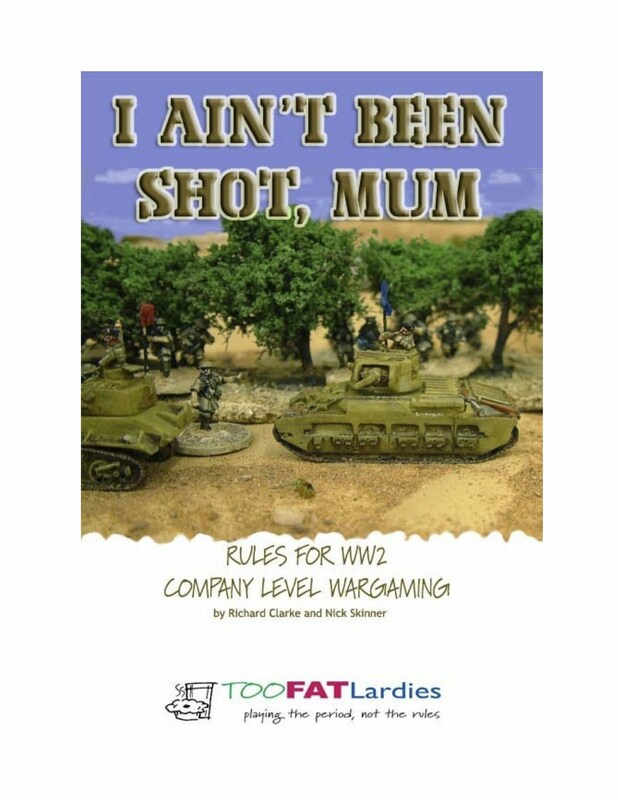 The Rapid Fire rules may be just right as an introduction to an era of of which I know nothing. Le Feu Sacre was bait of a struggle for me for the reasons you cited, but I think to start I will give both these sets a good look. Once I build up my collection certainly I will look at BKC (like BP I think) and Spearhead. 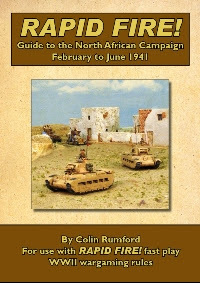 "I have pretty well completed the DAK forces for a starter scenario, and am well on the way to completing the Allied force. I do not see that as a problem." Music to my ears! Keep up the good work, and I'll try whatever rules you want to try (I just began reading IABSM).